BepiColombo will tackle a broad range of scientific objectives. The data collected by this mission will enable scientists to study the planet's interior and composition, geology and surface morphology, magnetic field, formation and evolution history, solar wind interactions, and the overall environment. 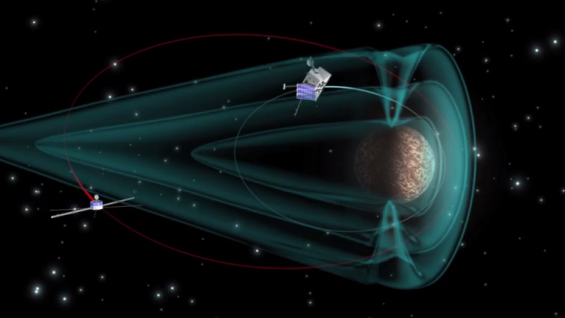 The mission is composed of two separate orbiters that will work in different orbits to explore the planet and its environment: the Mercury Planetary Orbiter (MPO) and the Mercury Magnetospheric Orbiter (MMO). The MPO (led by ESA) has the primary goals to image and map Mercury throughout its orbit, while the MMO (led by JAXA) will study Mercury's magnetic environment (exploring, as the name suggests, the planet's magnetosphere, the region of space dominated by Mercury's intrinsic magnetic field and its interactions with the solar wind). How did Mercury form, and what can we learn from Mercury about the birth of the Solar System? Our entire Solar System formed from a large cloud of cosmic material known as the solar nebula—by exploring the composition and subsequent evolution of the planets within our cosmic family, we hope to learn more about what this initial cloud was like (and what it was made of). How has Mercury—and thus the Solar System as a whole—evolved since its birth? How has the smallest planet in the Solar System changed in the past ~4.6 billion years? What can we learn about the origin and evolution of a planet close to its parent star? What is Mercury like inside? Does the planet have a solid and a liquid core and what is the size of each? What is Mercury composed of? Previous missions have not detected a high level of iron on the surface of the planet, although this is thought to be a major constituent of Mercury. How much iron is there within the planet, and why is the core still today partially liquid? What is the size of the core? Mercury's uncompressed density appears to be higher than that of any other terrestrial body—why? Are there any signs of ongoing geological processes across Mercury's surface? Is the planet geologically active today (like Earth but unlike other terrestrial planets such as Mars)? Is it volcanically active? What types, distributions, and numbers of craters are present on Mercury today? BepiColombo will map Mercury's surface features—craters in particular—and explore surface deposits. Mercury has a highly elliptical orbit close to the Sun; therefore it encounters amongst the most extreme environmental conditions (high temperatures, high radiation dose, large amount of charged particles) in the Solar System. How do planets that orbit so close to their parent stars form, and how do they evolve over time? Mercury's perihelion (closest approach to the Sun) has been shown to advance over time, something that has been explained in terms of space-time curvature. Can we use Mercury's extreme proximity to the Sun to test Einstein's theory of general relativity? Mercury appears to have an intrinsic magnetic field—unlike Venus, the Moon, and Mars—and associated magnetosphere (the region of space over which Mercury's magnetic field dominates). How is this magnetic field generated, and what is it like? How does Mercury's magnetic field, magnetosphere, and atmosphere interact with the solar wind? A continuous wind of charged particles floods the Solar System from our star, interacting with the magnetic environments around the inner planets and creating phenomena such as aurorae, populating radiation belts, and driving magnetospheric storms. Do these phenomena occur on Mercury as they do on Earth? Mercury appears to have a tenuous atmosphere, no ionosphere, and to possess a thin, changeable exosphere. How is this exosphere formed and replenished? How is it structured, and what kind of dynamics occur there? There are known stores of existing water on Mercury; we know that the permanently shadowed regions of some of Mercury's polar craters contain deposits of ice—but is this pure ice or mixed with other materials? What are these other materials and what is the origin of the ice? Are there some water molecules locked up within the planet's atmosphere? BepiColombo will observe interplanetary dust from comets or asteroids and other space debris to gain a better picture of the inner Solar System, and to better characterise a number of processes occurring in and near the Sun—strong solar shock waves, for example, which we do not see around the Earth. How do these form?